Owning a condominium brings with it the challenge of keeping every single one of your tenants happy and comfortable. While that can be a tall order, of course you want to do everything in your power to attract new tenants and to ensure that existing leases are renewed, or that your properties are sold. And these days that means more than offering basic amenities like air conditioning and trash removal. Whether you’re a property manager leasing condos, or the owner of a building that is selling condos, the competitive landscape is fierce. Tenants and buyers alike are looking for luxuries, including state-of-the-art gym and recreation facilities, and even on-site grocery and food options. But one thing that is no longer considered a luxury is reliable cellular service. On the contrary, tenants consider this a must have. That’s not surprising given the fact the percentage of cellular-only homes outpaced those with landlines for the first time last year. Today, if your building is filled with dead zones that cause dropped calls and other frustrating issues, it’s going to cost you tenants and buyers. Unfortunately, many condominium buildings are plagued by poor signal and dead zones. This is due in large part to the materials used to construct them, including brick, concrete, and steel. So, as a condo property manager or seller, what can you do to fix the problem and avoid losing money because of the problem? While there are several solutions to address poor cell signal, a passive distributed antenna system is best suited for improving signal within condo buildings. Passive DAS boosts existing cellular signals, bringing them inside of your condo building and amplifying them to improve coverage for your tenants. There are three specific reasons passive DAS is the preferred option vs. traditional, or active DAS, solutions when it comes to improving your signal and eliminating dead zones. Passive DAS can be deployed zonally. Compared with active DAS, which requires the installation of cable and fiber optics, passive DAS solution can be added in specific locations throughout your building. This zonal approach allows you to deploy as many boosters as you need to ensure strong, consistent, quality cellular signal. By taking a zonal approach you can improve cellular signal exactly where you need to within your building. Passive DAS doesn’t require major construction. As mentioned above, the common solutions owners turn to for mitigating dead zones often rely on the installation of detailed and intricate cabling and fiber optics that must be installed throughout the entire building in order to be effective. This means construction that causes noise, disruption and unhappy tenants. Furthermore, it’s completely unnecessary when passive DAS solutions are extremely effective and can be installed quickly and seamlessly. Passive DAS is carrier-agnostic. 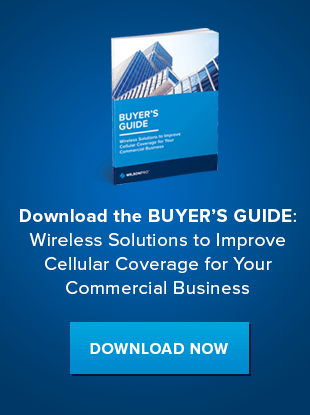 Property managers and owners often believe that they must work with a specific cellular provider, or whichever provider owns the nearest cell tower to improve signal in their building. In reality, however, it’s much better (and affordable) to boost your cellular signal using a solution that is carrier-agnostic. This way, every one of your tenants will benefit from an improved signal, no matter which cellular provider they use. While it’s important to note that not all cell signal boosting solutions are carrier-agnostic, WilsonPro offers a variety of cell signal boosters that are completely carrier-agnostic. If you’re looking for the best and most affordable option to meet the demands of your tenants by improving the cell signal in your condo building, contact us today.